Sample format of application letter for employment In Police Service of your district, province, country like UK, USA, Africa, India, Pakistan, UAE or EU etc. Being an ex-serviceman at Ministry of Defense, Africa. I am interested in continuation of my security service in your department. I have served the border forces as captain for twenty years under contract with MOD. I have finest employment record with distinctions awarded for my services. I have attached all the records and achievements along with the other required documents. Kindly consider my application, I shall be waiting to hear response from you. After having seen your advertisement in the newspaper I would like to apply for the job as a policeman in your department. As far as I am concerned, I have passed the bachelor degree in criminology and working as a Team Leader in London Fire & Rescue Service. I have extensively worked along with other agencies and police to rescue people during misfortunate incidents. Physically I am quite healthy and fit, suitable for this job; fulfill all the requirements from your department for a policeman. 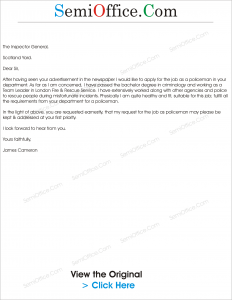 In the light of above, you are requested earnestly, that my request for the job as policeman may please be kept & addressed at your first priority. It is a great honor to serve your country and doing it by joining the police force is the best way to do it. Coming from a Forces background, I have been raised to join the police force. I understand the sacrifices one has to make in order to protect his motherland. I am willing to serve and die for the sake of its protection. I hope you will consider me as a candidate for thie job. I will be looking forward to hear from you.